The procedure takes two hours or more to complete, this really depends upon how tortuous, or curvy your blood vessels are. Angioplasty and stenting is usually done through a small incision or puncture or sometimes a small incision in your skin, called the access site. A catheter is inserted in the artery in your groin. Using X-ray guidance, your physician then guides the catheter through your blood vessels to the blocked area. The tip of the catheter carries the angioplasty balloon or stent. A dye that can be seen on x-rays (radiopaque dye) is injected, and x-rays are taken so that the narrowed area can be located. After the stent and filter are placed, the catheter is removed. In most angioplasty procedures, a stent is placed in the blocked artery. A stent is a small metal mesh tube that is implanted in the arteries to help keep the blood vessel open. Stents may be coated with drugs that help keep the artery open. Hemorrhagic stroke usually requires surgery to relieve intracranial (within the skull) pressure caused by bleeding. Most of the damage caused by this type of stroke results from the physical disruption of brain tissue. Treatment of intracerebral hemorrhage differs from that of an ischemic stroke. Anticoagulants thrombolytic drugs, and antiplatelet drugs are not given because they make bleeding worse. 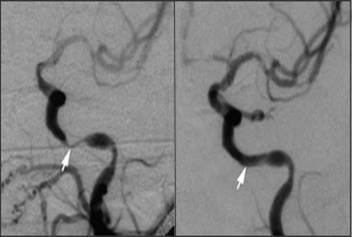 Surgical treatment for hemorrhagic stroke caused by an aneurysm or defective blood vessel can prevent additional strokes. Surgery may be performed to seal off the defective blood vessel and redirect blood flow to other vessels that supply blood to the same region of the brain.